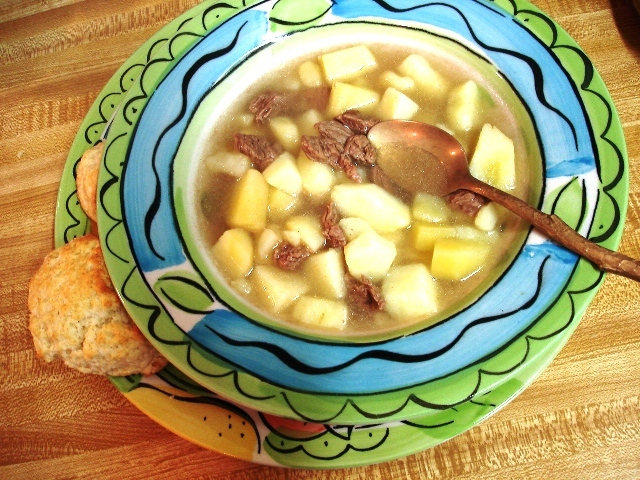 This stew is perfect for a cold or rainy day. Fricot is a traditional Acadian dish that I learned about from my mother-in-law. I love all kinds of soups and stews but my husband will only eat this one. Thankfully the kids have also learned to like Fricot over the many years I’ve been making it. It is a success story for me in that regard considering the kids had refused to eat it for years and have really grown to love it over the past year or so. This is the only way in which my daughter will eat potatoes besides french fries and my son gobbles it down and drinks the broth. I always make fresh Baking Powder Biscuits while the stew is cooking and I’m sure that adds to the allure of this meal. This weekend I had planned on grilling some steak and potatoes but when the day turned out to be rainy I decided to change the menu to Fricot because I knew the kids would eat it. This is another instance when the same ingredients prepared in a different way appeals to them since they won’t eat grilled steak and potatoes. My mother-in-law also makes Chicken Fricot and sometimes adds dumplings to the stew while it’s cooking. Brown onions in some oil in a large stock pot. 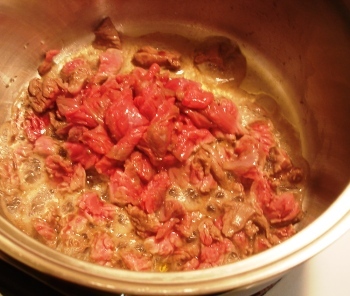 Add steak and brown. Add cold water and potatoes. 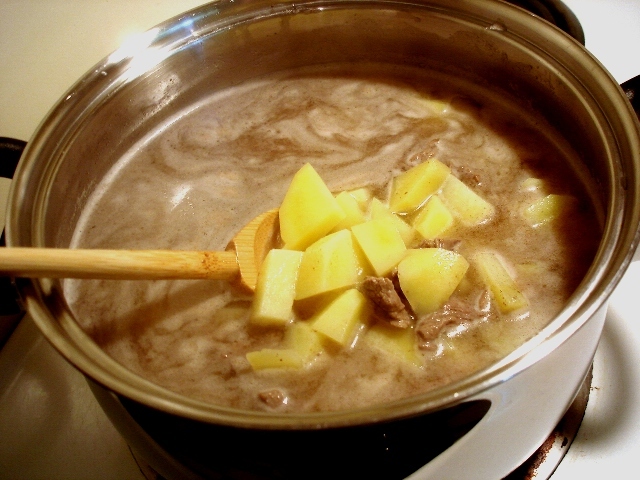 Bring to boil and cook until potatoes are tender. Do you have a potato bowl? This is mine and it's the perfect size for the diced potatoes for Fricot. 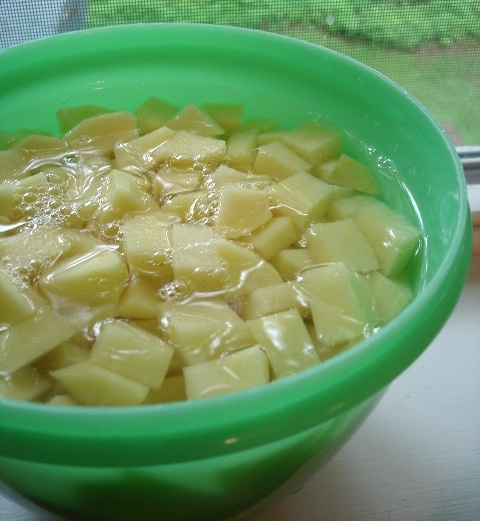 I just peel and chop the potatoes into the bowl and rinse with cold water several times to get the dirt and starch off. Here we are browning the meat. This is my husband's job because he practically performs surgery on the steak to get all the fat cut off. He's picky about the fat. I like making this dish because we prepare it as a team effort and then we can sit and relax while it cooks. Be prepared to add a lot of salt and pepper as some people find this dish quite bland but really that's the way it's supposed to be. 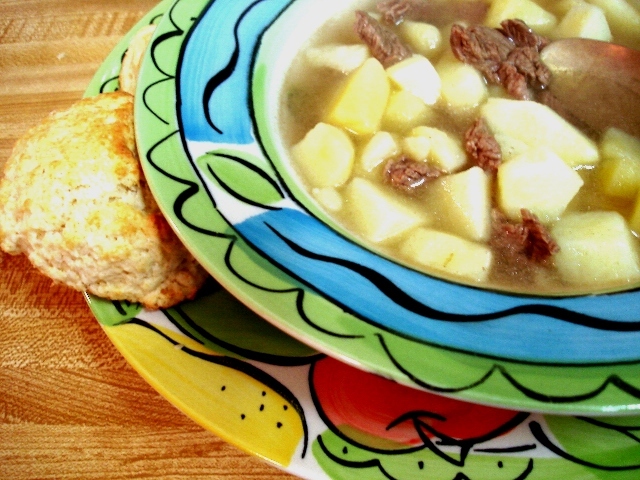 beef, biscuits, canadian, french, meat, potatoes, recipe, Recipes, soup, stew, Tried It! This looks really yummy! All of your recipes always make me wanna cook more and eat more! I have to add this to my daily click blogroll. Thanks for sharing.